Some more textured knitting for Lynne's textured winter KAL. This is the Cairn hat from Ysolda Teague'sWhimsical Collection. DIL and I have been through all the cupboards to find a suitable bowl for blocking it. Nothing quite the right shape or size. I think I will have to try her solution of an inflated balloon. First however, I'll have to prise it from DIL's head. It's just past noon here and the temperature has just scraped 6°. Windchill takes it down further. Still it's warmer than Katoomba where the windchill takes the current temperature down to -8 °. DIL loves hats and has an enormous collection, weird and wonderful, race day hats, polar fleece SpongeBob Squarepants, jester hats. You name it, she has it and pretty well all of them suit her. This one was intended for me but it's really a bit sloppy on my head, while it fits her perfectly. Lucky girl. The purple is Bendigo mystique and the black is Bendigo alpaca, both from the stash. There is a pattern for wristwarmers as well in this stitch but I don't think I have enough of the purple/deep mauve to do them. The stitch is easy, just a slip stitch which is carried up several rows. The honeycomb is achieved purely with the pull on the row above and beneath by the slip stitch. 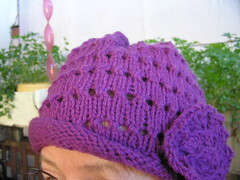 Hat in the photo is sitting on a large ball of Bendigo cotton in rose pink with a smaller ball on top. The pink is destined for a ballet cardigan with short sleeves for the next granddaughter down. 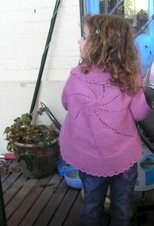 I also bought some cotton in deep mauve for the smallest granddaughter who loves such colours. Along with those came a ball of 4 ply luxury Bendigo in a beautiful flame colour for a second Ishbel shawl for me. About a month ago, a close friend gave me a big bag of oldish circular needles which had belonged to his mum who died about eight years ago. I've only just looked at them. He told me to be fussy about them and some will will be tossed. I really love my Knitpicks options and many of these older needles have cables much stiffer than I'm used to. I'll go through them carefully but think a lot will go. I was about to throw the bag when I saw something in the bottom of it. At first I thought it was just a piece of scrap but pulled it out and looked. It was this cardboard "knitting register" as it is announced on it. It has come from an English magazine, so perhaps there were giveaways even thirty or forty years or more ago. The first two columns are for counting rows and the count goes to fifty. At the bottom of each column the silver piece slides up and down and the instructions suggest placing it just beneath the row it is counting. The third column is for counting increases or decreases, while the fourth column is to keep track of the number of times a row or pattern repeat is done. Over on the back are instructions and the names of several English magazines. Down the side, the holes are a needle gauge complete with the illogical old numbering system where the larger the needle was, the lower the number it was given. I wonder just how accurate the cardboard was as a size gauge? I can see that one hole has been ripped to the edge of the cardboard. Perhaps that was a popular size used by this knitter. I've already been given some wool from her collection and have used some of it. There was some very old Patons mohair from the 60s and lots of the early 12 ply, the forerunner of Jet. I emailed Patons re info on these wools a couple of years ago, as I could not find anything anywhere. I enjoy reading history and I love the sense of being connected with people from the past. I was thrilled to get this old gauge and to see how well used it was. I also have another old needle gauge in metal, in the shape of a bell. I think it was made by Anchor, but don't have it handy to check. It was another serendipitous find at the bottom of a bag of knitting stuff from a large Salvation Army op shop. I like to think of using these old objects and wonder at their story. Knitters today are part of a long tradition. While knitted clothes and other warm goods are much more readily available than they would have been years ago and we perhaps are not forced to knit to be warmly dressed, there is still a tradition that we are part of. The gauge and the bell are just part of this . What lovely finds! I like a bit of history, too. What a great find! Size 8 was a very popular size - 8s and 10s for 8ply, 10s and 12s fdor 5ply!! See even I remember!! Apparently, the old sizes were to do with the sizing of fencing wire: the thicker the gauge the smaller the number! Weird, huh? I forgot to say: the cairn hat is a very intriguing pattern! I'm with you on the vintage stuff. To know knitters before me handled those items, it's just thrilling! Gorgeous hat! I have that pattern and am contemplating it. I was given a bag of knitting gear when my grandmother moved into assisted care. A few balls of acrylic and long metal needles, but the really smile-inducing finds were the half-used balls of old Patonyle, sock needles and an old Paton's sock and glove booklet. Apparently my Grandpa liked them so much that my Grandma used to knit a lot of socks :) Also an enormous hank of what must be darning yarn - it's not soft like the Patonyle, and feels like it has a lot of nylon in it. It's lovely for me to handle these things handed down for my Grandma - with a special zing because I taught myself to knit without knowing of her skills.